The Atlanta Regional Commission (ARC) has released the draft of the Atlanta Region’s Plan for public review and comment. If you have opinions about the future of transit in the Atlanta Region, we encourage you to take a look at the planned transit projects. The plan defines a 199 mile rail and bus rapid transit network. Approximately 50 miles exist today, with another 93 miles planned for implementation by 2040. The plan includes $12 billion in potential transit expansion projects. The transit expansion projects include Connect 400, Clifton Corridor, I-20 East, Clayton County High Capacity Transit, Connect Cobb, I-285 High Capacity Transit, and Beltline/Streetcar projects. How can you have a voice in the process? The Atlanta Region’s Plan Preview Reception – December 16, 2015 from 5:30 – 8:00 p.m. 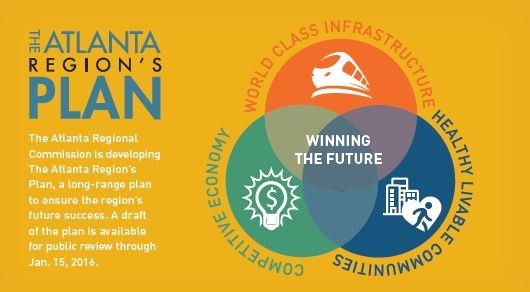 The Atlanta Region’s Plan Open House – January 14, 2016 from 8:30 – 10:00 a.m. and 3:00 – 6:00 p.m.
All meetings will be held at 40 Courtland St NE, Atlanta, GA 30303.